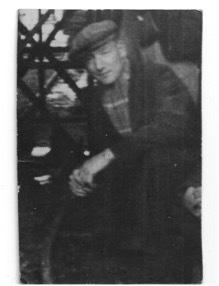 The photograph below is I understand taken of my father Charles Moreton, who died in the 1937 disaster, on his start of shift at Markham Colliery, circa 1936/7. 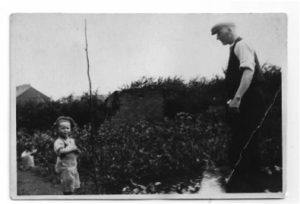 Below is the only photograph of me with my father in the garden of my maternal grandfather in Grey Street, Clowne, summer of 1936. These two photographs of my father form the only close reference I have of the early years !933-1937. Recognising the number of years that have now passed, my memories of my Father are very limited, being only some three and half years old at the time of his tragic, and premature death. May 1933 to January 1937, to use the term ‘Recollections and Reflections’ would be more accurate. These, are much, as a result of many exchanges and discussions with other family members particularly my two grandfathers who over the years were most helpful, filling the role as best they could, of that which would normally be filled by a father. Paternal Grandfather William Moreton served in the Sherwood Foresters Notts & Derby Regiment in the first World War, was injured and gassed. He was discharged from military service on health grounds in August 1917. He went to live high in the hills (‘the benefit of fresh air’) in Holmfirth, Yorkshire, West Riding. Maternal Grandfather William Martin, Grey Street, Clowne had a major spinal injury occasioned in, I believe to be late 1920’s Oxcroft No1 colliery. Widowed in 1933, my mother being married and left home, he was left to maintain himself, two sons William & Ron and another daughter Hilda. A man, very hardworking, of independent mind, and a committed Christian (Salvation Army). Following the death of my father, we (Mother, elder brother Ralph, sister Jean, Roy) went to live at his home in Grey Street, Clowne – Mother assisting in the bringing up of her siblings (2 sons William & Ron and another daughter Hilda ). This arrangement also providing us with a home and near support. The most difficult aspect for those of a later generation, when attempting to understand past tragedies is the effect that such Mining/Industrial tragedies had on families and individuals most affected, beyond the personal hurt and emotional suffering. Our mother with three children was left without her husband, wage earner, facing unknown future difficulties. There was little if any, help or support in the mid to late thirties. Counselling, social services, financial benefits system, N.H.S. services which we are now accustomed to as ‘a right’, did not exist. Doctors, hospital, medicines had to be paid for as and when required. Thus all the stress of childhood ailments associated with three children she had to face somewhat alone, along with the financial burden of healthcare/medicines. Our grandparents, though they themselves were far from well, helped enormously over the early and most difficult years. From the age of eight or nine, I spent most of my school holidays with my grandparents at Holmfirth. Mother would take me by bus to Sheffield, then put me alone on the bus to Huddersfield, where I would be met, this giving mother some day to day relief. For myself a very different life experience to that of the mining village of Clowne. I also believe it gave me sense of independence, along with a more expansive view of differing lifestyles. Additionally it gave me the opportunity to get to know my Grandfather Moreton – through our many walks over the lanes and moors, also an introduction to aspects of music (brass bands, choral singing and The Huddersfield Choral Society “Messiah at Easter”). It was on such excursions, he made me more aware of some aspects of my Great Grandmother Moreton, who was to me a little strange, what brought this about? Following his discharge from the Sherwood Foresters (Notts & Derby Regiment) having been injured and gassed, he was discharged on Health Grounds August 1917. In the November her other son Ralph a gunner in the Royal Field Artillery was reported killed and buried near Ypres, Belgium. Then to learn of the tragic death of her grandson, my father, hurt her beyond imagination, and she withdrew from the world, reclusive is the term I would now apply. One son injured for life, second son killed In the service of his country, then her grandson killed in the Markham disaster, it is an awful lot of pain for one aged lady. 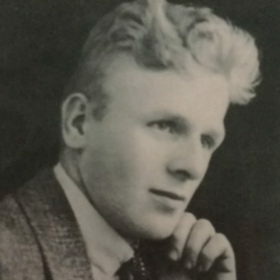 Having to come to grips with and handle our individual and family loss/misfortune of the social culture of the 30/40’s – our personal, family tragedies were within two years of the great uncertainty and hardships of growing up in the Second World War (the sky one large orange glow – the ‘Blitz of Sheffield’). In my opinion it has given us the strength and desire to win through. To reflect on what has been, without bitterness, and see the positives of what we have achieved in own individual lives .